The music and dance season in Chennai is unique with more than 1000 music concerts and dance recitals organised by three dozen sabhas. 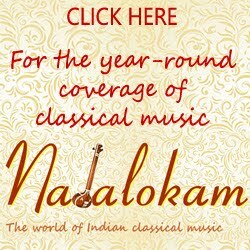 www.chennaidecemberseason.com brings all the schedule of concerts, the feel of the season, experience at the venues, conversation with artistes to the readers. Beginning December 2009, our website has brought in more than 6,00,000 readers and as the season proceeds, the visits to the website increase many folds. The effort of gathering information and bringing it to the readers require many hands, their time and effort. At the same time, this platform is a great gateway to reach the potential clients for businesses looking for taking their products and services to them. So, we have opened up a few slots for advertisements. The following are the slots and rates. These are combined rates for two months November & December. 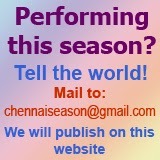 Contact us by mail to chennaiseason@gmail.com. Season 2019: Schedules done in March!